I don't usually go out to lunch. I have a one-course meal at home which takes less than 10 minutes to eat. I start on the dot of 1pm. The phone always goes. I don't answer it. I greatly believe in my late friend Robert Mitchum’s dictum: "Why should any bum with 10 cents be allowed to intrude on my life?" On Saturday I do go out. I used to visit Harry Morgan, a restaurant in a ghastly area of north London called St John's Wood. 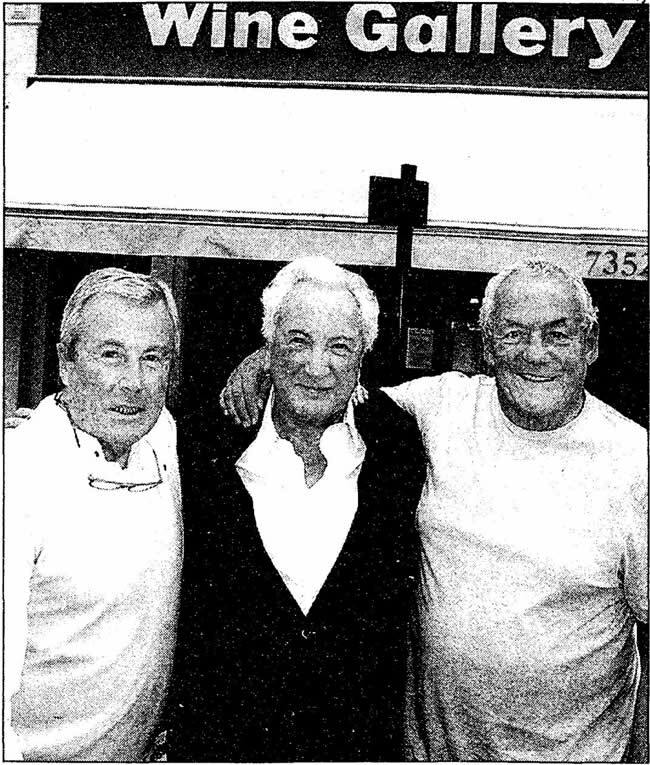 I went with Terry O’Neill, master photographer, and Johnny Gold, who used to own Tramp discotheque. The food was good but it was a hopeless experience. Johnny knows every Jew in London. He assures me he knows gentiles as well but I remain unconvinced of that. Sitting in Harry Morgan it was impossible to have a conversation because endless locals of the Jewish faith would barge in and talk to Johnny. I found that irritating. Johnny recently visited from Nassau, where he now lives. He suggested he, Terry and I should have lunch. Not at Harry Morgan but at Brinkley's on Hollywood Road in Fulham. So I took my Suzuki Grand Vitara on a rare lunchtime outing and luckily found a meter right outside. Not much use really because Brinkley's was shut. But then Johnny appeared from the Wine Gallery next door where he and Terry were waiting. The Wine Gallery (same owner, John Brinkley) is open for lunch. It’s narrow, there’s a bar, wooden tables in the front area, no tablecloths and paper napkins. Johnny assured me it was very popular with the horse racing fraternity. If it is they weren't in evidence. Only two other tables were occupied, one by the owner, sitting with a nice man, Sean Shelley, whom I knew from Barbados. Sean is front of house manager in Brinkley's. When it's open. The Wine Gallery menu was mercifully simple. Cottage pie, house lamb burger, penne, pork and leek sausages. home-made fishcakes and so on. "I'll have prawn cocktail and then cottage pie with peas," I said to the waitress. She responded: "The cottage pie, I had that for my lunch." I took it that she approved of my choice. The cocktail was nice: shrimp on top, avocado underneath. Johnny's goat’s cheese salad looked very colourful. My individual cottage pie came in a very hot bowl. "From the microwave?" I wondered. I also got a bowl of peas. John Brinkley, the owner, appeared. "Little late in the day," I thought. Observing my cottage pie Mr Brinkley suggested: "Tip it out." "I haven't got the energy to tip it out," I said. "Anyway, there's a napkin underneath. I can't tip it onto a napkin." Brinkley told the waitress to "turn it up". She took the pie and walked away. "It's obviously a big performance tipping this out. I’m sitting here like an idiot waiting," I said to myself. Mr Brinkley went to investigate why it was so difficult to tip the bowl up and put it on another plate. If this was a pit stop, Schumacher would have lost the race. "That's all you can ask," said Terry. Johnny had a vanilla ice cream with chocolate sauce. I had a brownie with ice cream and chocolate sauce. It was ﬁne. Not historic, not bad. Now we needed our photo. I called the waitress over. She took the camera and said she'd do her best. Then she asked: "What do I have to do?" "It's called a camera, dear, we’ll show you in a minute," I advised. Then I said: "Get Sean Shelley, he can do the photo." He was sitting at the back eating. Hadn’t even got up to say goodbye to us. "Unbelievable," I muttered. "I thought he was the host!" Now to the photo of Paola, our quiz two weeks ago. Guesses as to where it was taken range from "on a Thames barge at Teddington" to "Wigan pier". It was the Hotel Cipriani pool, Venice, June 21. 2005. Michael Cole of Kensington guessed the Cipriani on August 24! He gets a signed copy of the paperback of my autobiography, Winner Takes All, and £50. What more could anyone ask for? I'd ask for Rachel's organic milk to sort out their hopeless packaging! Identical cartons of milk come with three different ways to open. Two are okay. The third, a plastic loop attached to both sides of the top, when I pull it, always breaks. Then you have to attack the thing with a sharp knife! Milk goes everywhere. What I only have to put up with. Posh Bird and I regularly read Winner's Letters on a Sunday morning but neither of us has ever read Winners Dinners. Any good are they? You said last week you're not treated like an emperor at home. Take comfort in the quotation "A prophet is not without honour except in his own country." An alternative solution would be to change the crew. After all, you're paying for them. My husband and I also had the uneven table when dining at Lindsay House (Winners Dinners, last week). Now I know we’ve shared wobbly, inedible things with you l feel honoured to know our bottoms have probably shared the same seat too. I thought the earth had moved for me due to Richard Corrigan's fantastic food. But perhaps it was your aura left on the chair! I enjoy reading of culinary disasters you and Paola experience each week in vastly expensive restaurants, but my enjoyment would be even greater it you'd make a foray into more humble establishments, such as a supermarket cafeteria. Apart from the shock this might prove lo your system, many more recipes could be added to your eagerly awaited book, 100 Ways to Scramble Eggs. Such as lumpy, watery and tasteless. I'm disappointed that the majority of your experiences are in the south. Why not come up here? At the recently regenerated Box Tree in Ilkley, Yorkshire, the food was wonderful but the wine a challenge. I returned the very expensive red I ordered as it was cold, only to be told by some dumb waiter it was because their cellar is cold! My golden retriever, Barney, could work out the solution. But the wine waiter certainly struggled! You are my first read in the blessed Sunday Times broadsheet. Two weeks ago you posed a "when" and "where" question. I pose a "who" question. How many Michael Winners are there? The substance of each epistle is not in question. However the style and phrasing modulate in a manner suggesting the work of more than one scribe. I send kindest regards to the original.